"Romania is a country still steeped in tradition. Even on the streets of the capital, Bucharest, new cars travel beside horse and carts; it's truly a world where old meets new. On this highlights trip discover its dramatic mountains, medieval towns and fairytale castles. Transylvania - Delve beneath the Dracula myths at Castle Bran and marvel at the exquisite Peles Castle "
Arrive in Bucharest and meet the group and our local leader. Bucharest is Romania's largest city and became the capital in 1832 and thanks to a period of urban renewal and modernisation, it's now a bustling centre of Romanian culture, arts and media. We begin by our local leader taking us on a tour of Romania's capital. Bucharest is situated on the Danube Plain and set amid a series of lakes and spacious gardens and here we will see a remarkable blend of turn of the century elegance and communist excess. We visit many of the older parts of the city to discover the architecture that earned it the reputation as the 'Paris of Eastern Europe' such as the beautiful columned facade of the Romanian Atheneum concert hall and the Royal Palace of Bucharest. We also make a visit to the fascinating Village Museum where we can see a collection of old wooden churches, windmills and peasant dwellings from different regions of the country. This afternoon is free for you to relax and enjoy exploring Bucharest at your own pace. There's plenty to discover in the city's Old Town or there's a multitude of museums available to choose from including the National Museum of Romanian History, the Military Museum and the Folk Art Museum, to name but a few. Alternatively, perhaps you'd like to visit inside the Palace of Parliament, which is an incredible construction, the second largest building in the world and one of Bucharest's most photographed sights. Inside you'll find marble columns, grand halls and glittering crystal chandeliers. Many homes were destroyed to make way for this massive structure and it took 13 years to build at an alleged cost of over three billion Euros, so it's of little surprise that it was and still is a very controversial building. After a little free time for lunch we drive into Transylvania, and to perhaps what is the most famous castle in the world, Bran Castle, the apparent haunt of Count Dracula. Perched on a crag in a valley between two high mountain ranges, it dominates the surrounding scenery. We'll learn that the truth behind 'Dracula's castle' is even more fascinating than the myths. It was the home of the remarkable British born Queen Marie of Romania, grand daughter of Queen Victoria, whereas Vlad the Impaler, the heroic 15th century ruler of Wallachia who Dracula is based on, never lived here. In fact, the author of the much-loved Dracula novel, Bram Stoker never even came to Transylvania. This evening we will stay in a quaint local guesthouse in the Transylvanian village of Moieciu, where we have a delicious home cooked meal this evening. Romanian cuisine is hearty and their red wine is surprisingly good. A typical meal can consist from stewed beef, freshly baked bread, pearl barley, cabbage, roasted root vegetables and sour cream. Before a meal the locals tend to sip the aperitif, tzuica, a strong plum brandy. The Romanian bear population is one of the few strong and healthy ones remaining in Europe, and the Carpathian Mountains are home to about 43% of all European bears (approximately 6,000 individuals). This region is therefore of key international importance in the conservation of brown bears and due to increasing human-bear interactions, it's also the focus of research into the effective management of bears and their habitats. This morning we will visit the Libearty Bear Sanctuary, a home for rescued bears. Set in an oak and hazel tree forest; the sanctuary has assisted in rescuing countless bears from zoos and captivity and is helping to educate the local communities on the importance of looking after their native wildlife. There are around 70 bears currently at the sanctuary that roam free in a natural environment of large forested enclosures containing hibernation dens and cooling freshwater pools. Next we drive to Brasov to take a walk in the old town. Brasov is a treasure trove of centuries-old buildings and churches, cobbled streets and local atmosphere, all clustered within the medieval city walls and overlooked by a magnificent 15th century Gothic cathedral. We will stroll through the City Square and down the extremely narrow Rope Street before visiting the Black Church and having free time for lunch. We drive on to Viscri, which is one of the many Saxon villages found in Transylvania, but what makes it special is that it's wonderfully well preserved and the fortified church here is UNESCO-listed. It's a small village, with a population of no more than 500, from which only about 27 are now of Saxon descent. We'll take a walk through the village and we have the option to take a horse and cart ride to visit the church, the local baker, and the blacksmith that still ply their trade in the same way as they have for generations. This evening we arrive in Sighisoara, which is also a UNESCO World Heritage Site and feels a bit like stepping back in time. This tiny medieval city of winding cobbled alleys, pastel-coloured buildings, steep stairways and secluded squares now harbours cafes, craft shops and hotels. This evening we'll take a walk with our leader before having free time for dinner to sample the regions tasty cuisine such as beef goulash with dumplings, tarragon chicken or warming spicy soups washed down with craft beer. For dessert you could try one of the delicious cakes, which the town is known for. Before leaving Sighisoara this morning we discover its winding alleys on foot including the old town fortifications, the Church on the Hill, covered stairs and the clock tower. It's also possible to see the building where Vlad the Impaler was born. We drive to Alba Iulia to explore the city's spectacular restored star shaped citadel with its pointed bastions and highly decorative gates. In the old town we stroll along the wide, tree-lined streets and learn about its historical significance in the shaping of modern day Romania. Most of the fortification dates from the 18th century and inside the walls are a wealth of museums, churches, the Coronation Cathedral, and the Unification Hall, where the union between Transylvania and Romania was sealed in 1918. 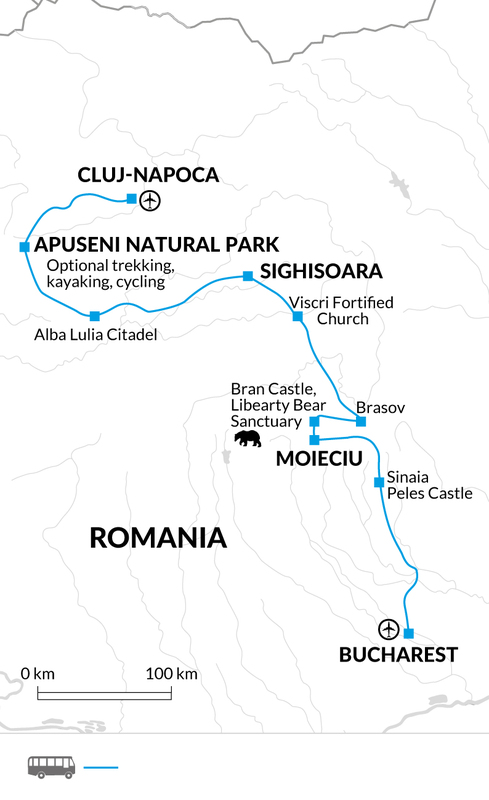 After lunch we travel to Smida, a riverside village in the heart of the Apuseni Natural Park. We check into our guesthouse which has a restaurant with outdoor terrace, sauna, Jacuzzi and tennis court. The meadows and rolling hills of the Apuseni Natural Park is an ideal base for outdoor activities or simply to sit back and enjoy the mountain vistas. Today is free for you to do as much or as little as you like. You might choose to hike through forests and hamlets where farmers young and old come together scything hay by hand and piling it onto high stacks. Alternatively you could try rowing on the nearby lake (June to September) or taking a horse and carriage ride. This morning we drive to the final location visited on our trip, Romania's second largest city, Cluj-Napoca. Blending a rich cultural infusion of Saxon, Hungarian and Roma influences, we stroll through the Baroque city centre stopping to view landmarks like Taylor's Bastion, the Banffy Palace and the Gothic Cathedral of Saint Michael, which has changed its religious denomination a total of five times since its initial construction and still dominates the downtown market area. This afternoon is free for you to further explore the city and perhaps to visit the National History Museum, or watch the world go by whilst sipping a coffee in a cafe on the Market Square. Alternatively, you could wander among the fragrant blooms of the Japanese Garden and native flowers found in the very popular Botanical Gardens. Our hotel is located close to the old town so it is in an ideal spot for exploring the city this afternoon. Our trip ends after breakfast at our hotel in Cluj-Napoca. Many of the castles charge a photography fee. You should allow approximately £15.00 for this. Additionally, the Libearty Sanctuary charge a photography fee of approximately £10.00. on day two the Palace of Parliament entrance is 40-45 RON (Romanian Leu). Please note you must take your passport with you to be permitted entry. It is still an active government building so it might not always be open to visitors and maybe closed at short notice. On day four you can take a horse and cart ride around the village visiting the local baker, blacksmith and fortified church approximately 50 RON. Trekking - self guided route information provided locally. Rowing - (available in June to September) easy grade on a lake. Self guided route information and equipment provided locally. Hire rates for a 1 person for 4 hours is 70 RON or 1 hour is 30 RON or a 2 person for 4 hours is 100 RON or 1 hour is 40 RON. Horse and cart ride - for 30 minutes for 1-2 people is 50 RON or 3-4 people is 70 RON. Football or volleyball courts - to hire a court during the day per hour is 100 RON or in the evening it's 150 RON per hour. Tennis court - to hire the court is 50 RON per hour and racket hire is an additional 10 RON per hour. July and August are the hottest months and lightweight cotton clothing is best. During spring and autumn temperatures can be lower or drop during the evenings and there is also a stronger possibility of rain, although light rainwear may be needed at any time of year. Layered clothing and a warm fleece are recommended for cooler evenings and in the mountains along with a windproof/waterproof jacket. Romania: Visas are not required by UK, EU, Australian, New Zealand, US and Canadian citizens. Other nationalities should consult their local embassy or consular office. The Carpathian region of Romania is home to an estimated 6,000 brown bears, which is one of the few strong and healthy populations remaining in Europe. The female brown bear can weigh up to 200kg and the males weigh in at around 350kg - the largest on record in Romania being an astonishing 480kg. Bears are most active in the morning and evening when they forage for food, then resting during the day in their woodland habitat. The mating season is between May and July and the cubs are then born over the winter and take their first exploratory steps in the spring. Towards the end of the summer, the bears will be more active as they seek out food to increase their weight before the harsh winter. Over the winter, the brown bear generally hibernates so sightings will not be possible. On this trip we will visit the Libearty Bear Sanctuary, a home for rescued bears. Set in an oak and hazel tree forest; the sanctuary has assisted in rescuing countless bears from zoos and captivity and is helping to educate the local communities on the importance of looking after their native wildlife. There are around 70 bears currently at the sanctuary that roam free in a natural environment of large forested enclosures containing hibernation dens and cooling freshwater pools. In just one week see all of Romania's most famous sights as well as spending time in the countryside and sampling delicious food and wine. Romania is a very affordable destination, it's easy to get to and it has so much to offer. It's a country full of mystery and folklore that captures the imagination.